Is Video Marketing Worth The Investment? Anyone can record a video on a phone and post it to social media but the focus for businesses should be on producing professional video. In fact, with so many unedited poor quality videos on the internet a professional looking video quickly stands out from the crowd. To help answer the question “Is video marketing worth the investment”? we need understand the benefits. Video marketing offers significant search engine ranking improvements due to video receiving greater interaction via website or social media. The chart below, produced by MOZ, shows a significant difference in interaction with video compared to standard text and images. Simply put, users are spending more time looking a video than viewing text and images. Video marketing is a powerful tool. There are many more video marketing SEO benefits including high authority inbound links to a website. Search engines assume that if these high authority links, such as YouTube and Vimeo, are linking to a website there must be something of interest to share. Sounds easy doesn’t it? Video marketing enables business owners to get their message across to millions of people in 60 seconds. Video marketing creates emotion, stimulation, curiosity and simplicity all of which helps to encourage engagement. As a website design agency we are often asked how important testimonials are on a website. We always say they are important but ultimately the end user makes their own assumptions as to how valid they are. 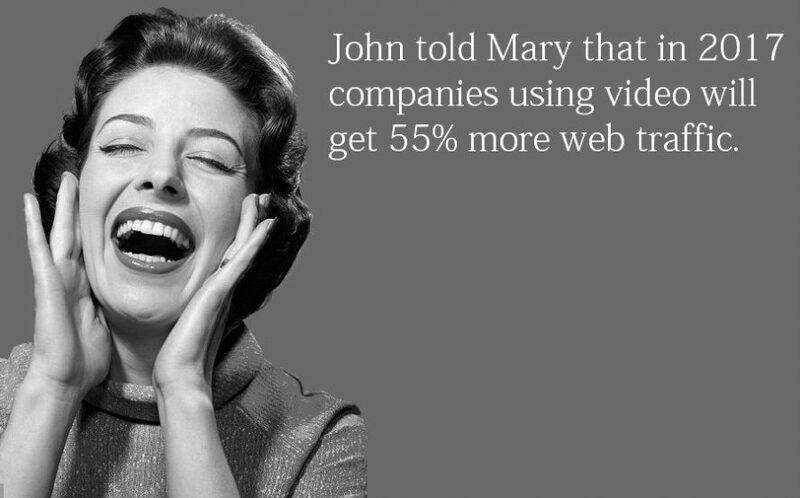 If however, video testimonials are used the end user is far more likely to believe the validity of the statements. Moreover, video offers the business owner with an opportunity to not only showcase their clients but incorporate their own messages, services, products and facilities. Click here to view an example of one of our customer testimonial videos. A professionally made video production, with a clear vision for how it is to be used and distributed, can very quickly see a return of investment. Website video in-particular can keep your customers engaged for longer ensuring that your business ethos and key messages are all presented to the viewer in a consistent structured way. Or think of it this way! If you are presented with a button on a website that says “Contact us for more information” how likely are you to click it? Are you concerned that you will be called or emailed? Maybe you are at the early stages of your research or maybe you click the button and never hear from the company again! Now suppose there was a video on the website rather than a button would you watch the video? Of course you would, why wouldn’t you. Now consider posting that video to all video hosting sites and sharing on social media. Yes – we believe video marketing is worth the investment. If you require any further information or would like to view our latest video marketing projects simply visit our website.